3806. 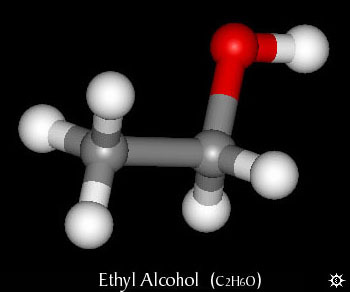 Ethyl Alcohol. Ethanol; absolute alcohol; anhydrous alcohol; dehydrated aocohol; ethyl hydrate; ethyl hydroxide. C2H6O; mol wt 46.07. C 52.14%, H 13.13%, O 34.73%. C2H5OH. Manuf: by fermentation of starch, sugar, and other carbohydrates; from ethylene, acetylene sulfite waste liquors, and synthesis gas (CO + H); by hydrolysis of ethyl sulfate, and oxidation of methane. Toxicity: G.S. Wiberg et al., Toxicol. Appl. Pharmacol. 16, 718 (1970). Embryotoxicity in mammals: N.A. Brown et al., Science 206, 573 (1979), Posibble mechanism for actions of ethanol on the brain: G. Aston-Jones et al., Nature 296, 857 (1982). Ethanol-induced chromosomal abnormalities in mice: M. H. Kaufman, ibid. 302, 258 (1983). Disruption of reproductive function in female primates following alcohol self-administration: N.K. Mello et al., Science 221, 677 (1983). review of metabolism and toxicity: C.S. Liever in Reviews in Biochemical Toxicology vol. 5., E. Hodgson et al., Eds. (Elsevier, New York, 1983) pp 267-312; of pharmacology: L. Pohorecky, J. Brick, Pharmacol. Ther 36, 335-427 (1988); of hepatotoxicity: C. S. Liever, L.M. DeCarli, J. Hepatol. 12, 394-401 (1991). General reviews: P. Baud, "Ethyl Alcohol Industry" in Grignard, Traite de Chimie Oranique vol. 5 (Masson, 1937) pp 841-975; Zabel, Chem Inds. (now Chem. Week) 64, 212 (1949); Faith, Keyes & Clark's Industrial Chemicals, F.A. Lowenheim, M.K. Moran, Eds. (Wiley-Interscience, New York, 4th ed., 1975) pp 355-364; P.D. Sherman, P.R. Kavasmaneck, "Ethanol" in Kirk-Othmer Encyclopedia of Chemical Technology vol. 9 (Interscience, New York, 3rd ed., 1980) pp 338-380. Clear, colorless, very mobile, flammable liquid; pleasant odor; burning taste. Absorbs water rapidly from air. d20/4 0.789. bp 78.5°. mp-114.1°. n20/D 1.361. Flash pt, closed cup: 13° C. Miscible with water and with many organic liquids. Keep tightly closed, cool, and away from flame! LD50 in young, old rats (g/kg): 10.6, 7.06 orally (Wisberg). The terms 95% alcohol and alcohol (when used alone) refer to a binary azeotrope having a distillate composition of 95.57% ethyl alcohol (by wt) and bp 78.15°. Alcohol, USP is specified as containing not less than 92.3% and not more than 93.8% by weight, corresponding to not less than 94.9% and not more than 96.0% by vol of C2H5OH at 15.56°. d25/25 0.810; d 0.816 at 15.56° (60° F). Diluted alcohol, prepd from equal vols 95% alcohol and water, contains about 41.5% by wt or about 48.9% by vol of C2H5OH. d25/25 0.931; d 0.936 at 15.56° (60° F). See U.S.P. XXI, 22, 1530 (1985). Caution: Nausea, vomiting, flushing, mental excitement or depression, drowsiness, impaired perception, incoordination, stupor, coma, death may occur, cf. Clinical Toxicology of Commercial Products, R. E. Gosselin et al., Eds. (Williams & Wilkins, Baltimore, 5th ed., 1984) Section III, pp 166-171. THERAP CAT (VET): Antiseptic. To destroy nerve tissue. Solvent and dehydrating agent.